Publisher: Get Set Games, Inc. Developer: Get Set Games, Inc.
Redford’s brother and sister have been kidnapped by a mysterious monster and taken far away! Take off on an amazing adventure across multiple worlds and dozens of challenging stages. Find Redford’s lost family and discover new worlds to explore by following the trail of stolen coins and Forest Gems! 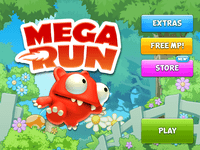 Mega Run – Redford’s Adventure is the long-awaited followup to Mega Jump, which has been downloaded by over 24 million people around the world! In Mega Run, you’ll once again take on the role of Redford the adorable woodland-dwelling monster, as he dashes across beautifully rendered worlds to rescue his lost friends and recover the stolen Forest Gems. Journey across astonishing and beautiful Worlds, each divided into 16 fast-paced Stages filled with multiple randomized routes, incredible powerups, and all kinds of hidden secrets to discover! Mega Run is aiming to be a genre-defining game, bringing true platform gaming to touch devices, with intuitive controls and gorgeous visuals. One-touch gameplay – jump, float, boost and fly with just one control! Randomized stages make the game unique every time you play! Turn enemies into ice blocks with Freezo! Jet over platforms and enemies with GravBoots! Unleash your inner monster with the terrifying Embiggenator! Become a blazing comet with the ridiculously powerful Fireball! Take on weird and wiley enemies trying to stop you in your tracks! Blast through destructible blocks to collect gems and coins! Launch into the air with powerful cannons! Challenges and special achievements make every stage replayable!